Being more "green" proves a popular New Years resolution this year. To be successful, the importance lies in taking baby steps to slowly develop a more natural lifestyle. To help you and your family realistically meet these goals, Johnson's Natural product line provides parents the option to start making those small changes to a greener life. The Johnson's Natural line, made for both babies and kids, contains at least 98% natural ingredients so you can feel good about the products you use on your children. With a starting price of $4.59, beginning your path to a more natural lifestyle just became more affordable. With over 100 years of baby care experience, Johnson's washes, shampoos, and lotions, already part of many parents' daily routines, can help your family take the steps to living more naturally. Also, Johnson's Natural line recently proved their worth by winning the 2012 Better Homes and Gardens Best New Product Award! Please visit http://www.johnsonsbaby.com/natural for more information about the products and ingredients, receive coupons and view a series of videos that offer tips on how to affordably incorporate natural living into everyday family life. I think a good goal for everyone this year would be to take baby steps to a more natural and organic lifestyle. You will definitely notice a difference in your health, energy, and could even achieve weight loss! Ever since I became pregnant with my first child, my family has adapted a more natural and organic lifestyle! As you know from my many organic and natural reviews/giveaways, it is very important to us and we have definitely noticed a difference in our health and wellness! We barely ever get sick (even my two year old! ), never need to visit the doctor/hospital and we feel healthier and have more energy! Plus, I never have to worry about all the icky chemicals and harmful ingredients going into our bodies from food, cleaners, and body care products! I am so excited to share that Johnson & Johnson, a very large company, is realizing how important natural products are too and starting to care about our well-being! I love that they have taken the small steps towards a more natural product...especially one for the sensitive skin and precious bodies of our children! 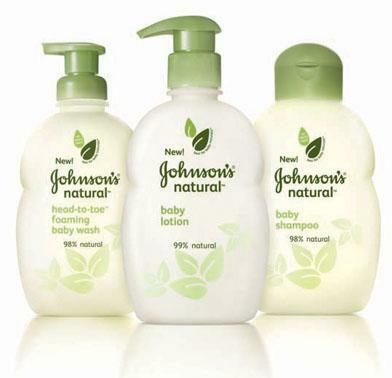 Best of all, their Johnson's Natural Baby products are affordable and sold at many local retailers! Start of your year by taking baby steps to a more natural lifestyle...I promise you will feel the difference! Buy It: You can purchase all Johnson's Natural products for a starting price of $4.59 at many local retailers! How are YOU trying to take steps to live more naturally?? Thanks for the review. I was wondering about these new products.